go2japan.org - New report shows Gospel growth in "missionary graveyard"
Asia (MNN) — Roughly 36 percent of the world’s population lives in either China or India. China is expected to hold the world’s largest economy by 2050. The 49 nations of Asia span 17,212,048 square miles, or approximately one-third of the Earth’s land area. Joe Handley of Asian Access says the world’s largest continent has a critical role to play in the Great Commission. In a recent report, Asian Access describes Gospel growth and the momentum they see building throughout Asia. “[During] the last two years, we’ve seen a breakthrough like we haven’t seen in the last 10 years of our ministry,” notes Handley. Asian Access comes alongside local churches to help develop and multiply leaders, as well as transform communities for Christ. They typically begin work in a new country every four years or so, Handley explains. However, since 2016, Asian Access started work in four new countries in Asia. Furthermore, ‘ancient walls’ are falling in places where Asian Access has worked for decades, and a new season for the Gospel is underway. As previously noted, the government of China is putting more pressure on the Church. According to Handley, Chinese Christians are refusing to back down. “They want to send 20,000 missionaries by the year 2030 from China to other countries…. Asian Access stands by ready to help in that task. Along with Christianity, a plethora of religions trace their roots to Asia: Islam, Hinduism, Buddhism, Shintoism, Taoism, and Confucianism, to name a few. The Gospel truth is easily lost in a cacophony of worldviews and tradition. Nonetheless, the Holy Spirit is moving hardened hearts in East Asia. “Japan is one of the largest unreached people groups…and it’s been known as a ‘missionary’s graveyard,’” shares Handley. The island nation has a long history of resisting Christianity, as described here. More ‘waves’ of disaster struck this year, Handley adds. “Whether it’s an earthquake or heatwave, it’s just been a very devastating season for Japan.” In areas hardest-hit by disaster, the Church has risen to the occasion. As a result, they’re also seeing similar, uncharacteristically high response rates to Christ’s message of hope. It’s a perfect set up for the Gospel opportunities that lie ahead. Japan is hosting the Rugby World Cup in September 2019 and the Summer Olympic Games in 2020. “Everyone I know sees this as an enormous opportunity, given the context that’s been happening the last seven years,” Handley notes. First and foremost, please surround Asian believers and the ministry of Asian Access in prayer. Pray for continued growth and open doors. Handley hopes to expand the work of Asian Access to 20 nations by the year 2020. Pakistan is on the horizon as well as Malaysia and Thailand. “We are desperate for your prayers,” Handley says. “The harvest is plentiful but the workers are few. Connect with Asian Access here to learn about short-term and long-term missions opportunities. If God’s calling you to help financially, click here to give. inset pie chart/map: Roughly 36 percent of the world’s population lives in either China or India. 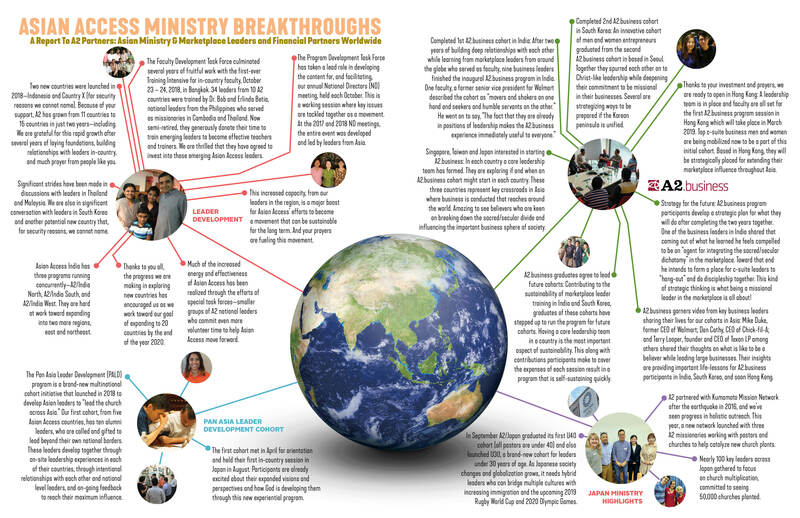 President's Progress Report: "Ministry Breakthroughs in 2018"
This 4-page progress report was produced in November 2018, which highlights ministry breakthroughs across all of our sectors in Asia.